8th Grade Parents - It's time to start thinking about High School! Don't be left behind! Start researching now and apply on time. Animation Students Attend Movie Premiere! 'Lego Ninjago Movie' Premieres in the U.S.
Coding Workshop!! Space is limited!! 8th Grade Dues are due by Sept. 29, 2017!!! 8th grade dues need to be turned into your child's Homeroom Teacher no later than September 29th, 2017. We accept cash or checks payable to Friend of King. Please remember that students must remain eligible: no fails & no more than 2 U's. Flyers were given to all 8th graders. Should you have any questions or concerns please contact our 8th Grade Sponsor Ruben Hernandez at rah3591@lausd.net. Here are several important dates for your family to mark on the calendar. Come be apart of our committees! King MS will be hosting our Annual Title 1 Meeting, Orientation and Parent Elections for SSC, ELAC, and SDM on Tuesday August 29th, 2017 @ 2:30 PM in the Auditorium. See you there! Student festival returns to the Vista Theatre again! Friends of King encourages you to incorporate some active transportation into your commute to and from school, or if you are visiting Thomas Starr King for popular events, like our TS King Theater Productions or New Student Orientation. Consider these benefits of walking and biking to school: * Safer streets * Less traffic * Reduced pollution * Healthy habits * Increased concentration * Social time * Joy *. The Parent Center will be hosting a Mental Health Workshop on May 30th at 8:30 AM. Everyone is invited to attend. The testing bell schedule is in place from May 1st to May 27th. Please note that during this time school is out on Tuesdays at 2:54 PM, while on Fridays school is out at 1:24 PM. The efforts on the part of parents, teachers and community members who voted for our school everyday last month have paid off putting King on the list of winners of a generous $25,000 ScholarShare grant. This grant money will be used to send students on field trips to enrich the curriculum, and also to enhance science, technology, and math instruction. Kudos to everyone who voted! King Students Win Digital Voice Awards Again! Students from Ms. Cimino, Ms. Guthrie, Ms. Hoefer and Mr. Palayan's classes are recognized for their outstanding efforts in film and animation. We will be starting our online enrollment for 6th and 7th grade students currently enrolled in one of our classes who wish to continue in our program next academic year (2017-2018). The online application now will be available on May 1st , 2017 on the LACER Learning website (www.lacerlearning.org) on the Special Topics menu. 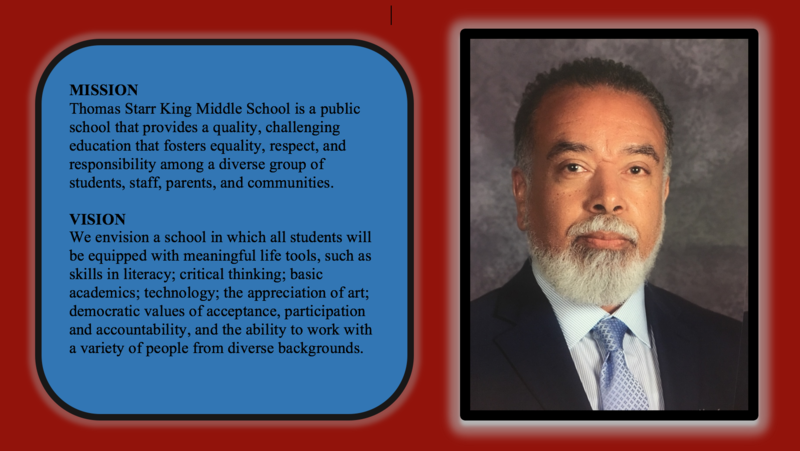 The announcement was made today by State Superintendent of Public Instruction Tom Torlakson, which included Thomas Starr King as one of the best 275 middle schools and high schools in the State of California. Our school made the list due to "excellent teaching, learning, and collaborating, and also highly successful school climate efforts“. According to Torlakson, "these terrific schools are leading the way in embracing our new rigorous academic standards and showing others how to help students succeed on their way to 21st century careers and college.” In addition to the California Gold Ribbon School, our school received an award for being a Title I Academic Achieving School. Students presented their service learning projects at the 38th Annual L.A. Environmental Fair at the Los Angeles County Arboretum and Botanic Garden. They presented research on the big ideas of sustainability and the Los Angeles River Watershed, as well as showcased their projects which dealt with issues such as recycling, reducing waste, composting and how to save energy.